Challenge accepted Eric! Listening to another educator is a great way to learn, to empower and to ground yourself. Our profession is amazing. Thank you for sharing this. Story-telling is vital and we need to re-learn the art using today's amazing tools. Images, videos, and words have a greater impact than anything else, ESPECIALLY when inspiring innovation, creativity and risk-taking. Thank you both for your comments. Our profession is amazing and it is up to each and everyone of us to share stories of excellence to honor those that deserve acknowledgement for their dedication to our students and to silence the critics. Stories can be told through social media, conference presentations, informal gatherings, and even award ceremonies. They key is that more people begin to act instead of just talk. Telling a story is an action step in my book. I accept your challenge, Eric. I have been attempting to share our story through my twitter account, the school's twitter account, and my blog. Unfortunately there are too many negative stories about education these days. We have positive stories to tell and it is vital that we share the stories of our schools. Jay - Together we can flip the script (and rhetoric for that matter). Danielle - I did not know about that. Thank you so much for sharing. What a great way to share and spread stories of excellence!!!! 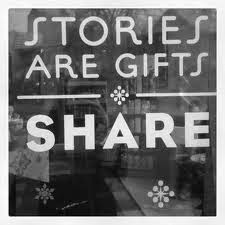 "Stories are gifts- share" is such a great way to leave a healthy and positive mark on students. I've always wanted to do this, I guess I need to find how. Thanks for the marvelous insight.